WestBend Waffle Maker. 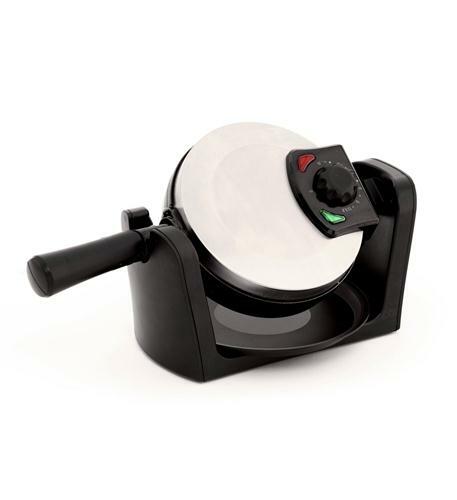 Professional quality appliance that makes 1" thick, 7" round gourmet-quality Belgian waffles with extra-deep pockets and 4 easy-to-cut sections. Rotates 180 for thicker waffles; crispy on the outside and light and fluffy on the inside. Non-stick coated baking plates are easy to fill and quick to clean. Cleanup is fast and simple with the dishwasher-safe removable drip tray. Brushed stainless steel housing compliments any kitchen. Features Cool-touch handle and "Power" and "Ready" indicator lights. Adjustable temperature control can be set from light to dark for perfect results every time. Compact, easy to store with fold-away handle and slot to store drip tray. Waffle maker can be stored standing upright to save cabinet space.